In recognition of a Brother of Alpha Phi Omega (AΦΩ), National Service Fraternity who has made contributions to America’s future as participating citizens through the principles of Scouting and the Scout Oath and Laws. Alpha Phi Omega, National Service Fraternity has established the Alpha Phi Omega (AΦΩ) Herbert G Horton - Service to Youth Award. It recognizes Brothers of Alpha Phi Omega, National Service Fraternity, who are in good standing that have made significant contribution to the youth of their communities by volunteering in the programs of the Boy Scouts of America. AΦΩ honors Herbert G. Horton’s memory, and the dedicated service he and other Brothers have given to Scouting by naming this award after him. The Alpha Phi Omega (AΦΩ) Herbert G Horton - Service to Youth Award is a Boy Scout Community Organization Award, used by community organizations to honor their volunteers for Scouting. 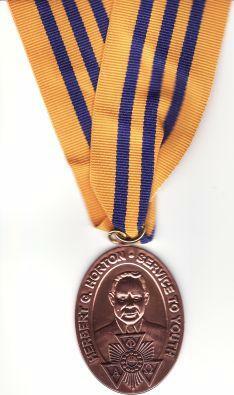 Recipients are presented a medallion on a neck ribbon (shown below) and may wear the generic Boy Scout Community Organization Award Square Knot shown above. The National Scouting and Youth Services Committee of Alpha Phi Omega, National Service Fraternity, invites chapters, recognized geographical or Chapter alumni association, alumni volunteers or elected officers to submit candidates for this award. The cost of the award will be borne by the recommender. (The official nomination form must be used.) Those interested in nominating someone for the award should log in to the APO web site and/or contact the APO National Office for the form. The recommender must complete the application and submit an attached page explaining the candidate’s qualifications for the award. The recommender must have the application approved and verified by the local Council, indicating that the candidate is currently registered as an active Scout leader. The recommender should then have the application sent to the National Office of Alpha Phi Omega, along with $40 for the award, for submission to the National Scouting & Youth Services Committee. The Committee Chair or a select subcommittee of that committee will then determine if the candidate is qualified. If so, they will authorize the National Office of Alpha Phi Omega, National Service Fraternity, to send to the recommender the award/regalia for presentation to the recipient. The National Office of Alpha Phi Omega, National Service Fraternity will be instructed to forward the information on the recipient to the Boy Scouts of America, Relationships Division, for the official record of recipients. assisting Chapters or Alumni Associations in developing a Scouting & Youth Services program and working with local Scouting units & councils, which might include events such as Merit Badge Universities. Work accomplishment and dedication, rather than a specific number of years in Scouting, will be the criteria for this award. Promoting and strengthening the relationship between AΦΩ and Scouting is an important part of this award. Thus, a Scouter who has little or no current involvement with AΦΩ will most likely not be considered for this award. Alpha Phi Omega (AΦΩ) Herbert G. Horton - Service to Award will be presented annually at a Regional Conferences or at the National Convention by a member of the National Scouting and Youth Services Committee. Recognition of previous and recent recipients of this award should be made at subsequent AΦΩ Section Conferences, Regional Conferences, and National Conventions. The Alpha Phi Omega (AΦΩ) Herbert G Horton - Service to Youth Award is a BSA Community Organization Award, used by community organization to honor their volunteers for Scouting. Recipients are presented a medallion on a neck ribbon in the Fraternity colors, a certificate and lapel pin, and if a BSA member, may wear the generic Boy Scout Community Organization Award Square Knot.